The fishes is the most diverse group of vertebrates on the planet; (the other vertebrates are the mammals, amphibians, reptiles, and birds). With over 34,000 living species of fishes, often it can be a little bit confusing - and even surprising - figuring out what constitutes as a fish. Simple is a good start. So what is a fish?! 2. Have functional gills throughout life. 3. Have limbs, if any, in the shape of fins. This 15 minute video will explain TONS about fishes in a short period of time. Hold on! There are exceptions to all of those general characteristics. 1. Some fishes, such as African lungfishes, can survive out of water for years at a time by ways of aestivating, or estivating, which is a dormancy to survive drought and heat (Graham, 1997); and the gilled African lungfish, Protopterus amphibius, has been reported to live out water in a cocoon for about seven years (Lomholt, 1993). 2. And the lungfishes, along with many other fishes, do not always rely upon gills for respiration; many fishes have lungs (like we have) and other specialized organs to absorb oxygen into their bloodstream. 3. Some fishes don't have paired fins (the pectoral and pelvic fins) and many appear to not have any fins at all (but usually do), like many eels, lampreys, and hagfishes. 4. Species of tuna and mako sharks are better described as poikilothermic, a variation of ectothermic, capable of warming body temperatures by way of a specialized heat exchange system known as the rete mirable and having thrust muscles more interior, minimizing heat loss. Opah, or moonfish, are better described as endothermic, or warm-blooded, as newly discovered evidence theorizes that they are capable of consistently keeping their bodies warmer than their surrounding environment (Wegner, 2015). 5. And finally, hagfishes don't really have a backbone; but this is thought to be a secondary loss, or a reverse trait (their ancestor possessed the trait and it was lost over time). CLICK ON AN IMAGE TO LEARN MORE or see the Table of Contents - The Fishes for a full listing of fish topics. Protocercal (Diphycercal), Leptocercal (Modified Diphycercal), Heterocercal, Hemihomocercal (Modifed Homocercal), Hypocercal (not Reversed Heterocercal), Homocercal, Isocercal, and Gephyrcercal. Important to get these down! 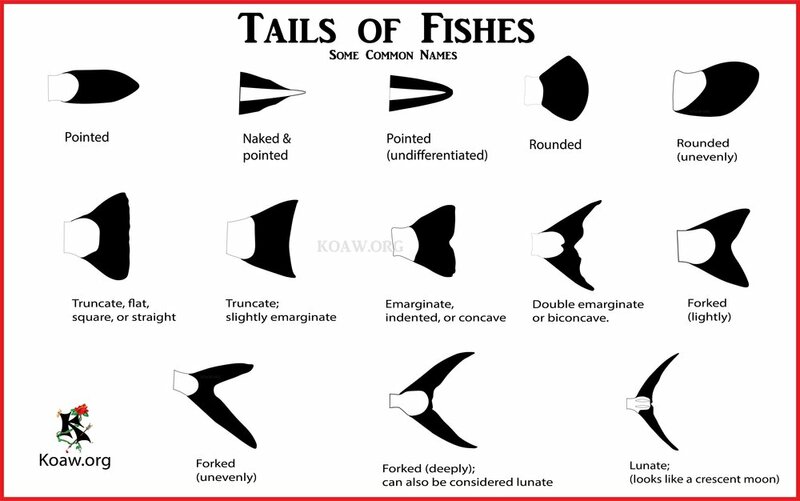 Notice that some fishes have 1, 2 and even 3 dorsal fins. Remember to close the mouth and measure with a horizontal (not angled) direction. This chart shows the separate zoning names of the pelagic, open oceans. A look at a broad range of mouth, jaw, and snout types within the fishes. Basic illustration showing the lateral line along the body and the cephalic dermal pores of the lateral line system. Generalized but detailed view of the location of the neuromast in the lateral line canal and the sensory hair cell of the neuromast. Ostariophysians account for about 30.8% of all extant fishes. Fishes are capable of detecting electric currents, magnetism, vibrations, molecules in solution, & light.